The Free Democratic Party is a liberal and classical liberal political party in Germany. The FDP is led by Christian Lindner. 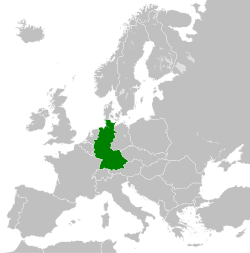 Germany is a democratic, federal parliamentary republic, where federal legislative power is vested in the Bundestag and the Bundesrat. Kurt Georg Kiesinger was a German politician who served as Chancellor of Germany from 1 December 1966 to 21 October 1969. Before he became Chancellor he served as Minister President of Baden-Württemberg from 1958 to 1966 and as President of the Federal Council from 1962 to 1963. He was Chairman of the Christian Democratic Union from 1967 to 1971. The Christian Democratic Union of Germany is a Christian-democratic, liberal-conservative political party in Germany. It is the major catch-all party of the centre-right in German politics. The CDU forms the CDU/CSU grouping, also known as the Union, in the Bundestag with its Bavarian counterpart the Christian Social Union in Bavaria (CSU). The party is widely considered an effective successor of the Centre Party, although it has a broader base. The Hallstein Doctrine, named after Walter Hallstein, was a key principle in the foreign policy of the Federal Republic of Germany from 1955 to 1970. As usually presented, it prescribed that the Federal Republic would not establish or maintain diplomatic relations with any state that recognized the German Democratic Republic. In fact it was more nuanced. There was no public official text of the "doctrine", but its main architect, Wilhelm Grewe, explained it publicly in a radio interview. 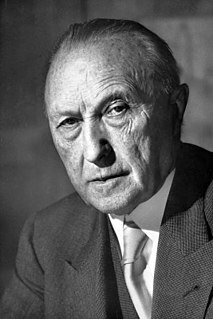 Konrad Adenauer, who served as Chancellor of Germany from 1949 to 1963, explained the outlines of the policy in a statement to the German parliament on 22 September 1955. It meant that the Federal German government would regard it as an unfriendly act if third countries were to recognize the "German Democratic Republic" or to maintain diplomatic relations with it – with the exception of the Soviet Union. The West German response to such could mean breaking off diplomatic relations, though this was not stated as an automatic response under the policy and in fact remained the ultima ratio. 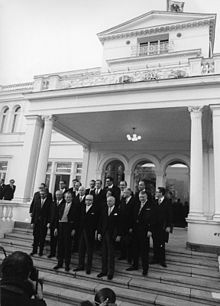 Neue Ostpolitik, or Ostpolitik for short, was the normalization of relations between the Federal Republic of Germany and Eastern Europe, particularly the German Democratic Republic beginning in 1969. 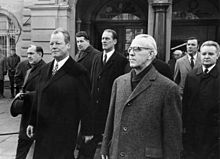 Influenced by Egon Bahr, who proposed "change through rapprochement" in a 1963 speech at the Evangelische Akademie Tutzing, the policies were implemented beginning with Willy Brandt, fourth Chancellor of the FRG from 1969 to 1974. Federal elections were held in Germany on 2 December 1990 to elect the members of the 12th Bundestag. This was the first multi-party all-German election since that of March 1933, which was held after the Nazi seizure of power and was subject to widespread suppression, and the first free and fair all-German election since November 1932. The result was a comprehensive victory for the governing coalition of the Christian Democratic Union/Christian Social Union and the Free Democratic Party, which was reelected to a third term. Federal elections were held in West Germany on 25 January 1987 to elect the members of the 11th Bundestag. 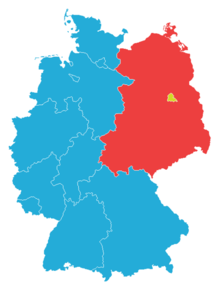 This was the last federal election held in West Germany prior to German reunification. 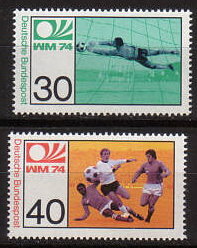 Federal elections were held in West Germany on 19 November 1972 to elect the members of the 7th Bundestag. In the first snap elections since 1949, the Social Democratic Party for the first time in the history of the second German republic became the largest party in the Bundestag, winning 242 of the 518 seats. The coalition with the Free Democratic Party was resumed. Federal elections were held in West Germany on 28 September 1969 to elect the members of the 6th Bundestag. The CDU/CSU remained the largest faction and the Social Democratic Party remained the largest single party in the Bundestag, winning 237 of the 518 seats. Federal elections were held in West Germany on 17 September 1961 to elect the members of the fourth Bundestag. CDU/CSU remained the largest faction, while the Social Democratic Party narrowly became the largest individual party in the Bundestag, winning 203 of the 521 seats. Federal elections were held in West Germany on 14 August 1949 to elect the first Bundestag, with a further eight seats elected in West Berlin between 1949 and January 1952 and another eleven between February 1952 and 1953. They were the first contested elections since 1933 and the first after the division of the country. The Federal Minister for Foreign Affairs is the head of the Federal Foreign Office and a member of the Cabinet of Germany. The current office holder is Heiko Maas. Since 1966, the Foreign Minister has often also simultaneously held the office of Vice Chancellor. 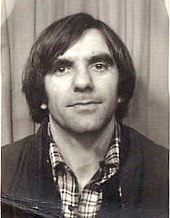 Dr. Erich Mende was a German politician of the Free Democratic Party (FDP) and Christian Democratic Union (CDU). He was the leader of FDP from 1960 to 1968 and the third Vice Chancellor of the Federal Republic of Germany from 1963 to 1966. The Chancellor of Germany is the political leader of Germany and the head of the Federal Government. The office holder is responsible for selecting all other members of the government and chairing cabinet meetings.